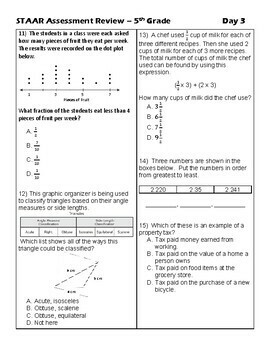 20 days of questions to help your 5th grade math students prepare for the most important test of the year,,,the State of Texas Assessments of Academic Readiness, or STAAR. Students complete 5 questions a day for practice, review, and discussion. 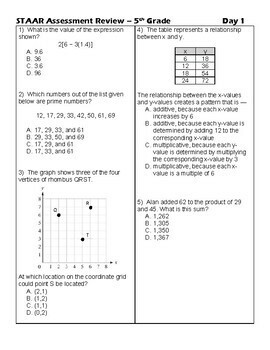 Questions are a mix of multiple choice and open-ended, so that students can practice both. Questions are based on the Texas Essential Knowledge and Skills, or TEKS. For added accuracy, questions are formatted after questions that the Texas Education Agency has released from previous years (2018, 2017, and 2016). 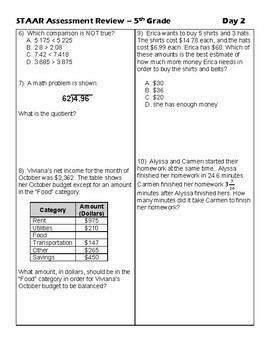 Use these questions as classwork, homework, centers, etc. This packet also makes a great review for students at the beginning of the 6th grade year. 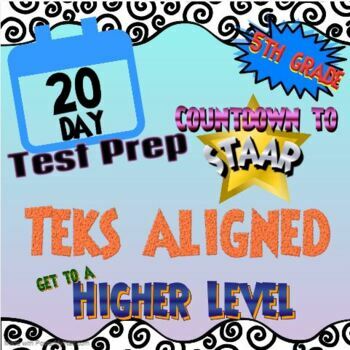 4th Grade Math Test Prep: 10 Days of Review for TEKS, FSA, AzMerit, etc. And there's even more in my store. As always, if you like this resource, please rate it. And follow my store. I am frequently adding new materials. Thank you.